These 1/4 yard, 4000 lb. 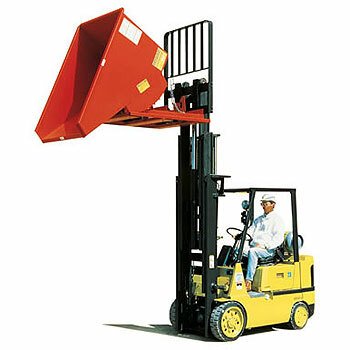 capacity dump hoppers are designed specifically for use with forklifts. 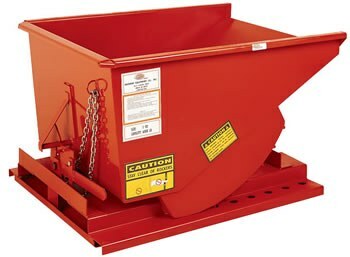 MECO Omaha Self Dumping Hoppers are perfectly balanced to tip forward and completely clear all contents safely from any height. 2 inch curled lips remove the danger of sharp edges while increasing rigidity, and a positive locking latch eliminates any chance of accidental dumping. Safe for wet or dry use thanks to welded seams that prevent leakage. Safety chain included to secure the hopper to your forklift. Empty units can be stacked up to 3 high. Shipped fully assembled.